Hi there! As part of my Reading Resolutions for 2016, I made a vow to read books that continue to make the ALA Banned Book List. 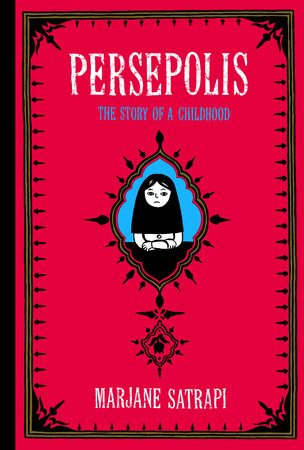 I’ve picked up a couple already, and had a chance to complete the graphic biography (which is a biography that is illustrated like a comic, or graphic novel) PERSEPOLIS: Story of a Childhood from Marjane Satrapi. I”m going to start this review with the end. I read the last page, closed the book, and burst into tears. There’s a reason I don’t read non-fiction or biography very often, and that’s because I read as an escape from the usual and difficult bits of life that often catch me raw. PERSEPOLIS is a biography, told in graphic “novel” format, illustrating roughly 6 years in the life of an Iranian girl from 1978-1984. This was a time of incredible upheaval in the populace and government of Iran, and marked by revolution, war and religious strife. As it’s a biography, it tells Marjane’s particular story, growing up with socially active and successful parents, who had some direct ancestry to the shah who’d been deposed in the 1950s. Also, her grandfather served high in the government, before being exiled. Marjane’s perspective is of a forthright and questioning child who doesn’t understand why her school is now for girls only. Why she must, suddenly due to the Islamic revolution, now wear a veil. Why she cannot possess Western clothing. Why her parents protest their government, and she cannot. Marjane is an only child, and she’s a bit precocious, but she’s also just plain curious and mystified about her world. She wants it to makes sense, and latches on to “heroes” of her environment, like her uncle who survived years as a political prisoner. Thing is, is seems life didn’t make much sense for the adults in the period, as Satrapi continually relates. Her parents and their neighbors are often performing a public display of allegiance, and privately live as they would choose–even taping their curtains closed so spying eyes cannot bear witness to parties and card playing and alcohol consumption. Revolutionaries believed they would install a democratic government and instead they got a theologic-based government of religious leaders. The hypocrisy of which was made quite clear, when all that was required was for disgruntled men to grow a beard and claim power, in the eyes of Marjane’s grandmother. I believe some of the most poignant passages illustrated Marjane and her peers talking about the revolution, the Iran-Iraq war and the human tollof all this upheaval. Young, primarily poor, boys being recruited to serve as cannon fodder–in exchange for the “key” to Heaven. The ban on travel for boys aged 13 and over so they could be assured of having soldiers in a war that could have ended, except it served the government’s purpose. The danger of having an outspoken girl in a repressive society. Marjane watches as more and more of her friends disappear, and experiences the terror of becoming a target of the morality police. I do not know much of the internal politics of this region, and found the brief and tidy snippets of history from young Marjane to be relevant, if not entirely explanatory. Without question, the book is a fantastic look into a world, and history, that should be more widely known. Further, it’s unflinching in its presentation, and accessible to a wide range of readers because of the perspective and voice. Regarding the “banned” label, the reasons cited for banning the book are as follows: gambling, offensive language, political viewpoint. Additional reasons: “politically, racially, and socially offensive,” “graphic depictions”. I’ll be honest, none of those parts of the book bothered me. If American citizens are outraged that a foreign-born person is citing use of CIA-trained torture tactics, including whipping, mutilation, urinating on a prisoner, burning alive, and dismemberment, they ought to complain to the government for allowing such practices to become part of their “arsenal,” not the school for having the book on the shelf. This book was on the reading list of my son in seventh grade. I live in a town that is ethnically and racially mixed, with a high percentage of college-educated residents, and some of the highest-graded schools in my state. It’s “liberal” and I’m proud to be a part of that vibrant community. Having read Persepolis for myself, I’m glad my son read it. I hope that it sparks the same skepticism that Marjane and her parents demonstrated regarding his own government. I think it’s an important book to read, especially now as we see more and more problems within the Middle East region. It humanizes the many thousands of people that live under a regime they perhaps do not agree with, and against which they resist in whatever manner is possible for them. I think it applies farther than Iran’s borders, in many respects. For myself, living in the nation with the largest free-standing military int he world, I can only voice my pacifism through demonstration and political will. I’m proud to have that right, and will exercise it, even as my fellows shout out my voice for cries to war. Thanks Marjane, for sharing your struggle. It’s a chilling story, and should be distributed far and wide, IMHO. Interested? You can find PERSEPOLIS on Goodreads, Amazon, Barnes & Noble, and your local library system…perhaps. Remember this is a “banned” book, so you may have to request it. I find it interesting that the cover was censored in my library, and have it in my mind to ask why upon returning the book. Marjane Satrapi (Persian: مرجان ساتراپی) is an Iranian-born French contemporary graphic novellist, illustrator, animated film director, and children’s book author. Apart from her native tongue Persian, she speaks English, Swedish, German, French and Italian. She currently lives in France. I read Persepolis quite some time ago at my daughter’s suggestion. I love your review. Thank you for promoting such a great graphic novel. I think Persepolis has also been made into an “animated” movie. I put animated in quotation marks because it’s not made like Mickey Mouse cartoons. I had no idea it was a banned book, and I don’t why the cover would be a problem. Thanks for sharing, Janie. It’s wild that our kids read such great books! There are always people who will disagree with the content of a book, and make an objection to it’s use (and presence) in a school library. I didn’t feel that this book was anything out of the ordinary realm, in terms of content. It’s definitely graphic, yet, being a biography I believe that those small areas of controversy (if it actually exists) are the meat of the matter, and the story would suffer if they were not present. They evoke such a visceral connection/response. The last panel at the airport just slayed me. It brings to mind the many images of Syrian refugees on boats, some tiny children with no parents–because they couldn’t afford to go along and prayed their sacrifice would benefit their child.